Singapore’s non-oil domestic exports took a beating in December, down 8.5% year over year, putting more pressure on analysts to pencil in a steeper growth slide in 2019 amid a backdrop of uncertain global demand and trade tensions. They also flagged the threat of rising inflation, which in tandem with the expected growth decline, could dampen consumer sentiment in the coming year. Robert Carnell, chief economist and head of research for Asia-Pacific at ING, said the December NODX result could not only lead to downward revisions in Singapore’s GDP growth print in the fourth quarter of 2018, but also heightens the downside risk to the research firm’s full-year 2019 GDP forecast of 2.5%.“Practically everything was weak. The consensus had been looking for a bounce of about 2% following the 2.6% year over year decline in November. It didn’t get it,” said Carnell of the NODX outcome, citing notable declines in electronics, chemicals production, pharmaceuticals, and petrochemicals. He added that, depending on industrial figures to be released in the last week of January, the economic data could push the research firm to ease down its full-year growth forecast. 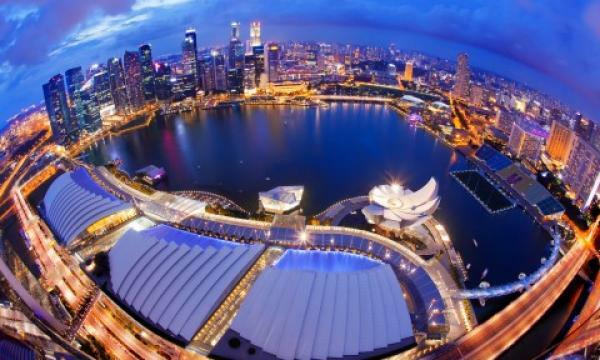 Steven G. Cochrane, chief APAC economist at Moody’s Analytics, said the research firm expects Singapore’s economy to grow at a slightly slower pace in 2019 at just under 2.5% from a bit above 3% in 2018. He said the growth outlook comes amidst a projection of a moderation in global expansion in 2019, particularly in the second half as fiscal stimulus in the U.S. wanes. “The potential for an all-out trade war between China and the U.S. will be the primary factor to watch,” said Cochrane. “If the trade war gets to the point of the U.S. instituting high tariffs on all imported goods from China, global growth and international trade will slow.” He added that Brexit uncertainty may also weigh on economic growth in Europe, which, in turn, would further slow demand for global goods and services. OCBC Bank has a slightly more upbeat outlook on Singapore’s full-year GDP growth in 2019 at 2.7%, but warned that greater uncertainties on global demand will take a toll on the island’s export-reliant economy. Aside from slowing economic growth, Singapore will have to watch out for an uptick in imported inflation. These two factors will dampen consumer sentiment and constrain spending, according to Fitch Solutions in a report last October. The research firm expects inflation to accelerate in 2019, increasing by 1.5%, up from 0.5% in 2018, as it anticipates higher imported oil prices to push up the transport component of the country’s consumer price index. It anticipates Brent crude oil prices to climb to an average of US$82.0 per barrel in 2019 from US$75.0 per barrel in 2018. With inflationary pressures mounting, Fitch Solutions forecast that retail sales will likely remain lacklustre in 2019 after dipping into negative growth territory in 2018. The research firm said it is likely that the Singapore government will next move to raise the goods and service tax from its current 7.0% after the recent hike in income taxes.